The Toyota RAV4 has been a popular crossover SUV for a number of years. This popularity is due in part to the fact that the RAV4 is a versatile vehicle that also has a track record of outstanding reliability. The RAV4 also has some very comfortable interior features. 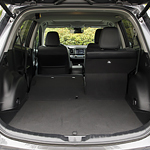 The Toyota RAV4 has fully adjustable front seats. They can be placed in multiple positions to provide maximum support. The seats are also heated, so you will stay warm even on the coldest winter days. The RAV4 has an available moonroof that can open to let in the cooling breezes. If you get too warm, a shade can be pulled across the moonroof to block out the sun. If the RAV4 sounds like a vehicle you would want to own, come and test drive the RAV4 at Lake Charles Toyota. The sales staff is waiting to assist you.